It's the kitchen appliance that changed the grilling game forever. 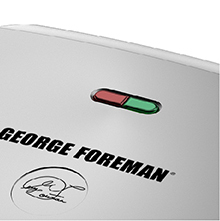 The George Foreman 9-Serving Basic Plate Grill and Panini delivers fast grilling and delicious results for steak, burgers, chicken, veggies, sandwiches, and more. 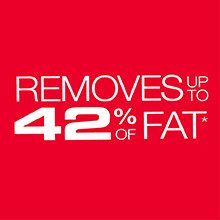 The proprietary sloped surface helps remove fat during cooking, and the George Tough nonstick coating wipes clean after every use. The large cooking area combines with dual contact heating to speed up grilling and get food on the table in record time. 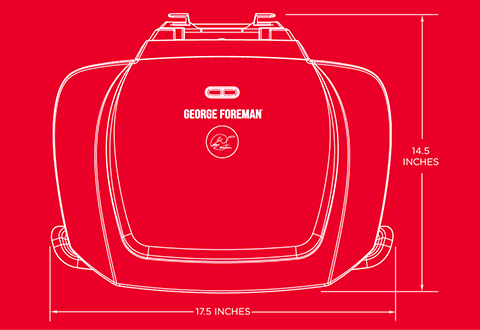 What will you make on your George Foreman Grill? Feed the whole family, with leftovers to spare! 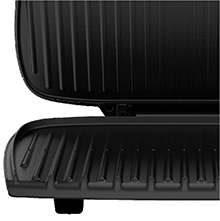 The 144 square inches of grilling surface lets you make up to nine servings at a time. Make up to nine servings of your family’s favorites. Use the slope or set it flat. 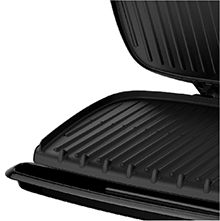 The kickstand on the back of the grill gives you options for removing fat as you grill or cooking on a flat surface. Easy-to-make wraps with fresh and bold flavor. For a meal that's on the lighter side, be sure to try these delicious Thai Chicken Wraps. 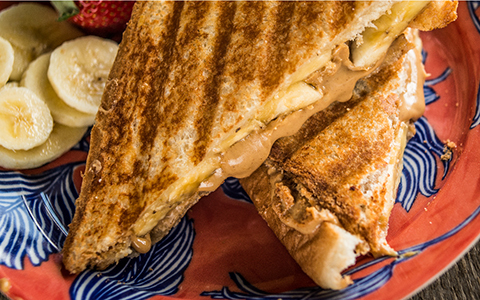 Pair with fresh fruit or hummus and crackers. 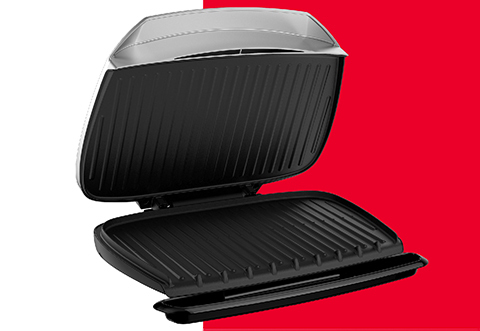 9-Serving Basic Plate Grill - Platinum is rated 2.8 out of 5 by 35. Rated 2 out of 5 by steph0987 from Great! for the first few uses It does what it says, but extremely difficult to clean. You would think if this were a 9-serving grill that the plates would be removable for safer and better cleaning. I've managed to completely strip parts of the non-stick coating off trying to get this cleaned. Definitely do no recommend this grill. Also, the heat is not evenly distributed from the center to the sides - I have to adjust cooking times for items on the outer sides. Rated 5 out of 5 by Rosebud from Love George Forreman products Very pleased with my purchase of this grill. Does a great job cooking my meats. Rated 1 out of 5 by asha13 from so sad I just bought this and was so excited to try it. The light indicator says it is heating, but my grill is barely warm. Rated 1 out of 5 by Tom A from Great for 5 month It was great for the first 5 month, then it stopped working... I was cooking and it simply stopped. No heat, no lights. Rated 2 out of 5 by moeo from disappointed This grill is hard to clean. The plates can not be removed. I regret buying it. Rated 5 out of 5 by OCD in the Kitchen from Simple and Practical Indoor Grilling Hi Everybody Had the earlier model George Foreman 9 Serving for years. Just ordered a new one because the old one was dropped though it has served us well. Yes it takes some technique to get good results. It's indoor cooking on a small appliance. Don't expect it to outperform your outdoor gas grill. Cooks Fish, Chicken, Veggies and Steaks awesome... We also finish Barbeque Wings and Ribs on it. Some of the complaints on this product are from folks who need the right information.... Frozen burgers? Not a chance! let them come closer to fully defrosted first. I cook Costco 1-1/4 Rib Eyes. They are marinated and allowed to come to room temp before cooking. PREHEAT the unit for 5 minutes....On Cleaning, I use a natural fiber kitchen brush, wet paper towels and a spray water bottle. Heat the unit for 3 minutes when cleaning.... I have a gas grill, 2 smokers etc... We use the The George Foreman grill all winter long. Yes it takes some practice and trial and error... So stop whining and get grilling!!! Rated 5 out of 5 by Bobby from Love this grill! This is my second one. Dogs broke my first. Love this grill! Just wish they made one this size with removable plates.